You are here: Home>Archive>Taylor Brown Collection.>Miscellaneous documents and objects.>Coronation diary, 1937. Diary for the coronation of Edward VIII 1937. A small booklet with gold cover. Inside, each page shows a month with a photograph of the Prince at various points in his life with a timeline on the last two pages. Edward VIII abdicated in 1936 and so was never crowned. Group: Miscellaneous documents and objects. Item: Certificate from St. John Ambulance Association. Item: Wolverton Sick Nursing Association Annual Report 1932-33. Item: Echoes of the Past. Item: Boys School, Church Street, Wolverton. Item: Newspaper article about Miss Florence Wildman. Item: Man sat in a deckchair. Item: Two people holding up a bedspread. Item: Frank Brown and a woman. Item: Three people, one an older woman. Item: Girl holding up a bedspread. Item: Receipt from The Whiteway Cocktail. Item: Receipt from the Hill Crest Hotel. Item: 32 beautiful pictures of Torquay'. Item: Hand drawn plans of the Firs. Item: Wolverton working Men's Social Club Member's card. Item: Passport for F.H. Brown. Item: Wolverton Express, Friday 8th April 1966. Item: Two letters from Beryl and Frank Brown whilst on holiday. Item: Letter to Lou from her Mother. Item: St George's Valentine Ball. Item: The Galleon at Wolverton. Item: The Straight Streets of Wolverton. 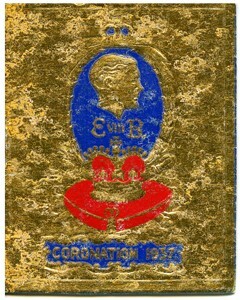 Item: Wolverton celebration of the coronation of King George VI and Queen Elizabeth. Item: Special Forms of Service in commemoration of His Late Majesty King Edward VII . Item: Daventry Early Closing Association Invitation Dance Card. Item: Secondary School and Church Street, Wolverton. Item: Letter to Aimee about the coronation of Elizabeth II. Item: A Souvenir of the Coronation of Her Majesty Queen Elizabeth II. Item: Children in fancy dress. Item: Service programme for the coronation of George VI and Queen Elizabeth. Item: Contribution card and Chapel rules for the Society of Graphical and Allied Trades, Wolverton Branch. Item: Minutes from a meeting to form the Ruling Department Combined SOGAT Chapel. Item: Balance sheet from the Ruling Department Combined Chapel. Item: Notes from a meeting. Item: Family Tree, Brown (0). Item: Family Tree , Brown B1 from B0. Item: Family Tree , Brown B2 from B0. Item: Family Tree, Brown B10 from B0. Item: Family history research for the Browns. Item: Brown Family Descendant Chart. Item: Hubert Chown Taylor and a lady. Item: Marguerite and Beverley Taylor.